I have to hand it to the British - they're definitely doing something right (or I'm an anglophile... It's both, really). The UK Supreme Court ruled unanimously that two gay men should be awarded asylum due to the threat of persecution in their home countries (Iran and Cameroon). I should mention the photo to the right is misleading - only five judges were assigned to the panel which ruled on the case. When I say "due to the threat of persecution", what I actually mean is due to having already been persecuted in the extreme and facing even more down the road. The Iranian man was attacked and expelled from his school when his homosexuality was discovered. Like wise, the man from Cameroon was also attacked in his own home after being seen kissing his partner. The men had previously been denied asylum in lower courts due to the fact that they could avoid persecution by simply hiding their homosexuality. They were told to relocate within their own countries and act "more discreetly" in the future. 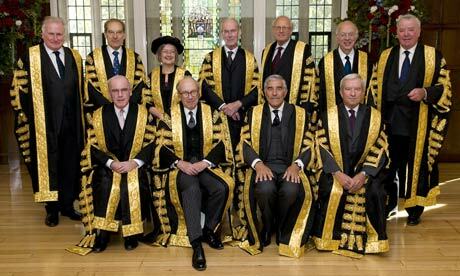 Clearly, that is crap, and thank goodness the British supreme court is made up of intelligent judges who knew it. Religious persecution has been a reason for asylum for years, and religion is definitely able to be hidden, yet it is awarded regularly by numerous countries. 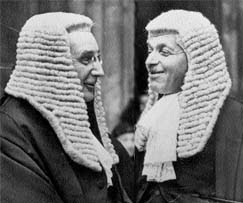 The foolish judges in the Court of Appeals who previously ruled against the men justified their decision because if they can conceal their identity, their situations are "reasonably tolerable". I know I'm a hopeless romantic, but I think most would agree that not being able to be with the one you love without constant worry and fear of being discovered is far from tolerable. Even if it wasn't a moral issue (which I argue that it is), the previous decision also went against the Refugee Convention, which the UK is a party to. "To compel a homosexual person to pretend that his sexuality does not exist or suppress the behavior by which to manifest itself is to deny his fundamental right to be who he is. Homosexuals are as much entitled to freedom of association with others who are of the same sexual orientation as people who are straight." In the future, all applications to the UK on the basis of persecution of homosexuality will be reviewed based upon guidelines the supreme court intends to pass down to the lower courts once they are created. I hope this is only the beginning of such progress in the UK and around the world. *Not actually Lord Hope, but better than any other Google results yielded.